Are you eager to learn and speak English Language? Or you want to improve your Spoken or Writing skills in English Language? If yes, then you are on the right place. 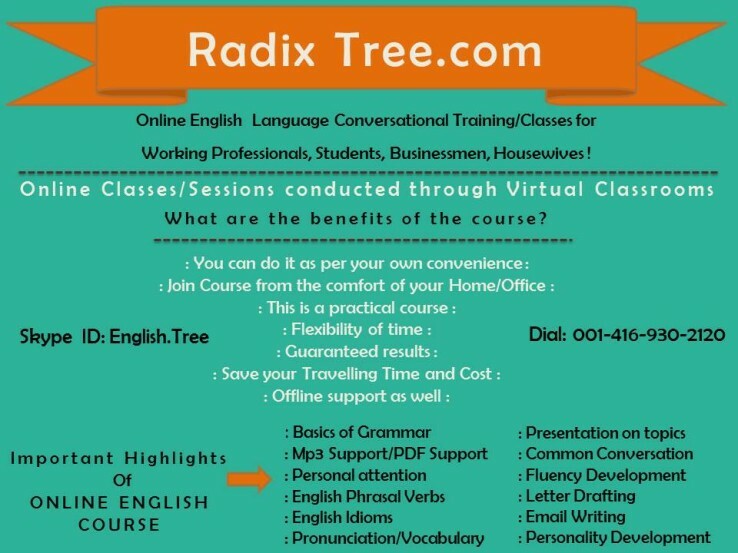 Radix Tree has taken an initiative to help house wives to learn English Language from scratch, or to enhance and improve their existing language skills. If you are a house wife, then this is best platform for you to improve your English language. Complete your house chores, tuck your kids in beds and then you can peacefully take these classes from the comfort of your couch or kitchen! There is no traveling required for taking classes, its one-to-one correspondence which will make you able to learn more and you will get maximum attention, there are flexible hours for classes, we have faculty of female teachers also, so if you want a female teacher, we can provide you. Your strengths and weaknesses in your language proficiency level will be acknowledged too. It’s a complete package for a house wife to be as competent as other language proficient women and men. So be the first to join these Online Classes. This is an innovative training module for Housewives. It acquaints the house wives with the four basic skills of English Language: Listening, Speaking, Reading and Writing Skills with care, comfort and confidence. It is a path-breaking assimilation of a variety of training innovations, carefully carved into a unique design. It is replete with a score of activities such as My Daily Routine, Memorable Moments, Image Interpretation, Story Telling and Role Play. It encompasses the chief components of the English Language such as grammar vocabulary Building, important and useful Communicative Functions and highly- helpful activities, extremely important for achieving good command over communication skill. As housewives have to successfully perform various duties, such as Home Management, Money Management, Cooking and looking after Children’s Education, useful units about Cooking Recipe, Home Management, Week end Plan etc. have been added with a view to providing the housewives with ample opportunity to help them acquire the confidence in speaking. This module has been specially designed for Housewives and adults to make them acquire the Communication Skills with ease, comfort and confidence. Speak English an effective way. Interactive English – a faster way to learn. Simply come casual with eagerness to find out and learn to speak English from a fluent English speaking tutor. Understand the basic grammar to speak & write. Basic Grammar-The Sentence, Parts of Speech, Tenses. If you are shy or lack confidence to speak English? Is the lack of speaking English affecting your personality? The course will make you confident enough to speak English and enhance your personality. Click on the link below for your free trial lesson class !